The newest group to bless Puerto Vallarta with its innovative and energetic presence is Media Luna. The group is made up of two brothers, Caleb and Jair Cabrera and their cousin Gibran and they are joined by Julio Renteria of Queretaro for vocal and bass and his brother Armando Jimenez Renteria (Jimmie) on percussion. These young men started their career together in 2014 and have been setting their adopted home of San Miguel de Allende on fire for the last several years combining gypsy rumba, flamenco, rock and huapango. It is an understatement to say they have taken Puerto Vallarta by storm with their original compositions and innovative arrangements of traditional pieces. Their shows in the cabaret at Incanto have been extremely popular. Caleb enjoys surprising his audiences with invited guests who make the show even more spectacular. They have drawn large crowds at Cuates y Cuetes two nights a week Tuesdays and Saturdays at 6:00 to8:00 and at Babel Bar on the River Cuale Sundays from 1-3. 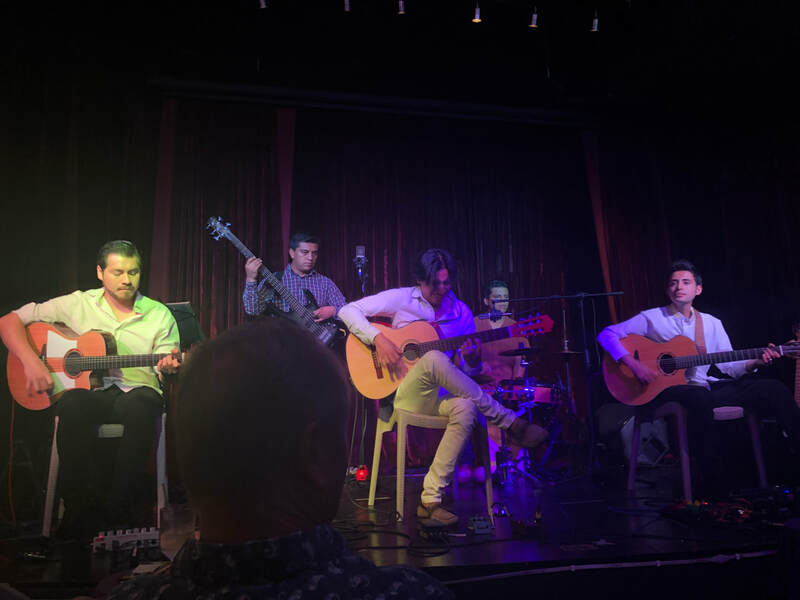 Jair says that it is just to give the crowd a taste of what expect at their more elaborate shows at Incanto's elegant cabaret theater every Thursday night at 7:00 PM, where they bring their entire band and feature surprise guests. Media Luna spent a month in Montreal last summer stealing the hearts of Quebecois this summer and generally play in San Miguel de Allende from October to December 2018. Puerto Vallarta welcomed them back on December 6th at Incanto's Cabaret Theater with a great show. Tree House Bar at La Cruz de Huanacaxtle (Coral 66) welcomed them for several shows in December including a New Years Eve spectacular performance and plan to feature them again in March. Along with the great music that they have thrilled listeners with in the past, Jair tells us that we can expect some completely new musical innovations. While I was in Leon on a music related trip recently, I was hoping to visit San Miguel de Allende to hear Media Luna perform. They were not playing in San Miguel that night but fortune smiled on me and allowed me to catch them for a lively performance in beautiful Querétaro. It was great to see these charming young artists again. Caleb, Jair and Gibran were looking forward to reuniting in December with all the good people they met last year in our delightful city by the sea. Attention Fans! At an exciting overnight event in San Sebastian del Oeste sponsored by Tree House Bar in La Cruz de Huanacaxtle and scheduled for February 23-24, 2019, Media Luna will be the principal entertainment for the evening. See Article in Vallarta Tribune of February 7, 2019 for details. Call Tree House Bar for details and reservations 322-182-4026. Price of Lodging, Dinner and Show is $80. Transportation is up to the attendee but we have good recommendations if you do not have a car. See Jorge under resources from Puerto Vallarta. More news! 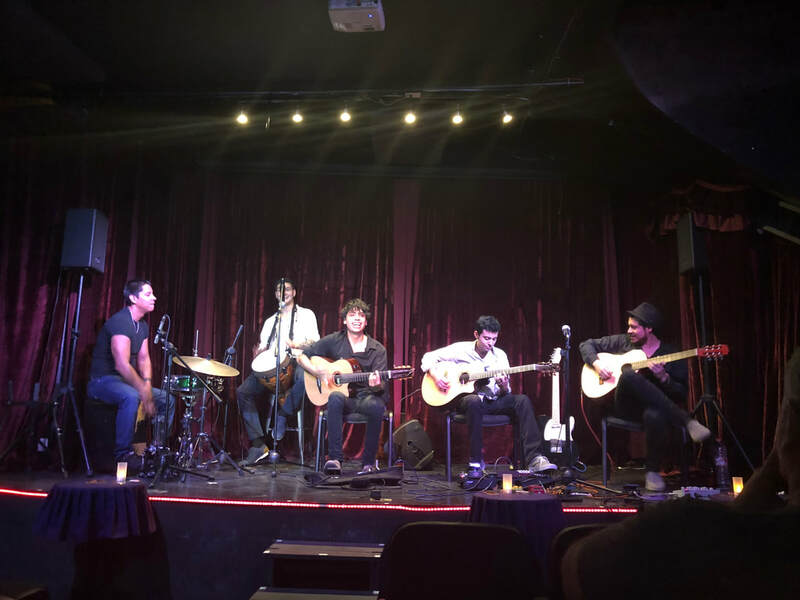 Media Luna held two incredible concerts in San Miguel de Allende on March 15 and 17, 2019. The concerts were beautiful and new showing off their new Latin Fusion music and talented and versatile full band including the Renteria brothers from Queretaro (Julio on bass and voice and Armando "Jimmie" on percussion) and guests Charly Peña from Guadalajara on flute and soprano sax as well as the indigenous wood instrument, the gena and Guilio Urango from Colombia on voice and accordion. They were extremely well received by their San Miguel fans!